Virtualization workloads generate many requirements and challenges for IT departments, including high performance, low latency, high-availability and the ability to quickly move and reconfigure workloads based on changing demands. 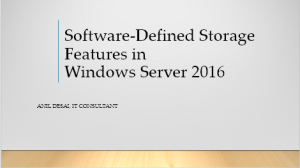 This presentation focuses on best practices for employing a wide array of different storage features in the Windows Server platform. Details range from the SMB 3.x protocol to data-deduplication, clustering, Hyper-V Replica, and many more related features. The presentation will begin with suggestions for determining requirements for different kinds of virtual disks and different business workloads. Based on these requirements, we’ll drill-down in to practical advice on how, when, and why these features can help increase service delivery and reduce costs for virtualized environments of all sizes. If you can’t make it to the live session, it will also be available for viewing after the conference. Update: The presentation was originally scheduled for October 18th, and has been moved back by one day. If the new time doesn’t work well for you, remember that the presentation will always be available on-demand, soon after the live recording. This event series brings the Build experience to cities around the globe. Best of all, there’s a good chance that the all-day event is coming free to a place near you. While I won’t be presenting any specific sessions in the Austin BUILD Event. I will be available on-site all day to answer questions during breaks. Be sure to register, if you plan to attend this free event (it’s at the amazing ACL at the Moody Theater downtown). If you’re unable to attend, you can still find the sessions you’re interested online at the Channel 9 BUILD 2015 site. Microsoft is soon hosting a great free event that Microsoft and the MVPs are putting on, May 14th & 15th. Join Microsoft MVPs from the Americas’ region as they share their knowledge and real-world expertise during a free event, the MVP Virtual Conference. As a member of the IT Pro selection committee, I can definitely vouch for the many interesting session topics (I’m planning to attend as many as I can on both says). The conference will be widely covered on social media, you can join the conversation by following @MVPAward and using the hashtag #MVPvConf. We hope to see you there! The Windows 8 Release Preview is now available to anyone’s who is itching to try out the latest (and last) publicly-available build before the final release of the products. Consumer-types can Download the Windows 8 Release Preview from Microsoft.com. The bits have also been posted to Microsoft TechNet and Microsoft Developer Network (MSDN). For now, my downloads seem to be going pretty quickly. As the products are getting close to release, I’ll plan to post some tips and info to this blog over the next few weeks and months. Feel free to comment if there’s anything you’re particularly interested in reading about. I might have posted this a little sooner, but all of my bandwidth is currently allocated to download the installation media and VMs. 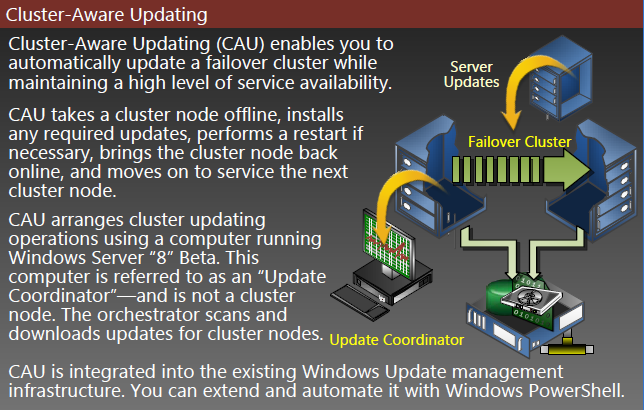 Windows Server 2012 (formerly known as Windows Server “8”) is nearing completing. With a “Release Preview” set to be available in early June, it’s a great time to bet familiar with the extremely long list of new features in Microsoft’s latest server platform. 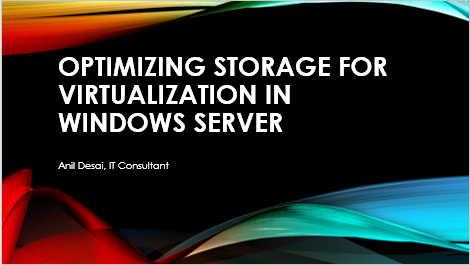 As an aside, I recently returned from the TEC 2012 conference in San Diego, where I gave two presentations on just the storage features in Windows Server 2012 and Hyper-V 3.0. That alone was a lot of information to cram into just a couple of hours. This no small release, and there’s a lot to learn. I hope readers of this blog are able to make it to either the Austin event or one of the many other locations which will be added soon! OK, perhaps it doesn’t get much geekier than decorating your office with large, complicated posters of technical knowledge. But I’ve always been a fan of Microsoft’s Component Architecture Posters (though I rarely have the opportunity to actually print and display them). These posters are designed to convey an large volume of information in a way that is easy for readers/viewers to consume and understand. They’re somewhat like the “infographics” many sites and publishers use to convey information in an easier-to-consume way. All information is current as of the “beta” version, and some relatively minor details (like VM CPU and memory limits) might change prior to the official release. 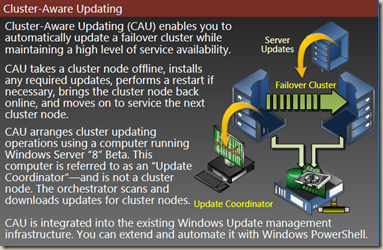 Thanks to John Howard’s post on the Windows Virtualization Team Blog for the information. I think we can look forward to an updated poster sometime prior to or soon after the general availability of Windows Server 2012. I’ll update this post if/when that happens. We started SQLSaturday in 2007 as a platform for free one day training events for SQL Server professionals. We focus on local speakers, providing a good variety of topics, and making it all happen through the efforts of volunteers. Whether you’re attending one or thinking about hosting your own, we think you’ll find it’s a great way to spend a Saturday. Events are currently scheduled through October, 2010 (see the site for details on dates and locations). Also, if you’re interested in speaking at one of the events, be sure to submit your session early. I’ll be presenting two SQL Server sessions (details below) at SQL Saturday Dallas 2010. As of this writing, it looks like there are nearly 500 registered attendees. It should be a great event! Despite the importance and value of relational databases, many developers and administrators often have only a basic understanding of how they work. This session covers the basic architecture of SQL Server, including basic installation and configuration of the server. The focus will be an overview of the most important topics, including: Managing database storage, performing regular database maintenance, managing security and data protection. Finally, we’ll conclude with some best practices for managing database schemas and objects. Attendees are encouraged to bring their server and database management questions. This session will begin with a brief architectural overview of Reporting Services and details on getting up and running with Reporting Services. Then, we will look at demonstrations of creating new reports by building connections and data sets using Report Builder and Visual Studio. Reporting design features including parameterization, dynamic drill-downs, matrix reports, charts, and sorting will be provided. This is one day FREE conference For The Community, By the community. The Conference is on May 15, 2010 at St Edward’s Professional Education Center from 8 am to 5 pm. Click the link on the Location Tab for additional information about St Edward’s. If you’re planning to attend, please be sure to use the site’s Session Voting page. This will give organizers and speakers some help in planning room assignments and will help speakers tailor their presentations for audience size. I’ll also be presenting two sessions at this year’s event. Below are the details. Feel free to respond here if you have any questions or comments on the topics, and I hope to see you there! This session will begin with a brief architectural overview of Reporting Services and details on getting up and running with Reporting Services. Then, we will look at demonstrations of creating new reports by building connections and data sets using Report Builder and Visual Studio. Reporting design features including parametrization, dynamic drill-downs, matrix reports, charts, and sorting will be provided. Next, we’ll look at deployment details, including scheduling reports, configuring caching, creating snapshots, and managing security. Time permitting, the presentation will include a demonstration of using Report Viewer controls within ASP.NET and Windows Forms applications. The session is intended for developers that have basic familiarity with report development (in any technology) and a basic understanding of SQL. Developers can dramatically improve performance by monitoring and analyzing real world queries. This session covers SQL Server monitoring at various levels to the most impactful performance improvements. The presentation will start with an overview of different optimization tools and techniques and will be based on practical examples of real-world performance monitoring and troubleshooting. Details include the use of server monitoring tools, SQL Profiler, the Database Tuning Advisor, and analyzing query plans, Dynamic Management Views, and related methods. The overall emphasis will be on solving practical, real-world database performance problems. This session assumes that attendees have basic familiarity with SQL Server and with writing database queries. IT people tend to be known for a lot of things (both good and bad), but the classic geeky poster seems to be a mainstay for most technical professionals. Among block diagrams, Dilbert comics that take thinly-veiled shots at clueless management, and software architecture posters, it seems like there’s something for everyone. The content helps illustrate that the R2 release isn’t just a minor upgrade – there’s probably a lot more in here than most administrators are aware of. You’ll also find a sidebar of acronyms and plenty of useful notes and tips. While it’s no replacement for complete documentation, I think these posters do a great job of providing a lot of information in a limited space. Join renowned Microsoft technologies expert Paul Thurrott, Windows IT Pro senior technical director Michael Otey, Exchange guru Paul Robichaux, and Windows IT Pro editor in chief Jeff James for an in-depth, spin-free deep dive into the new efficiency. This event is presented in an interactive, real-life simulation! You will experience a lifelike visual environment, networking and interactive tools, staffed sponsor booths, and educational chats to complement each conference session. I’ll be available to answer technical questions in the Microsoft booth during the morning sessions (from 9:30am to around noon Central time). Feel free to stop by and ask questions or view the materials and presentations that are available online. For more details, see the Agenda and Speaker Info pages. Be sure to Register – it’s free, and you don’t have to leave the comfort of your home or office to attend. 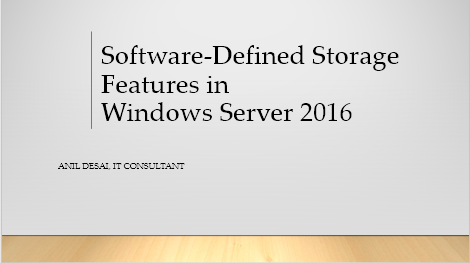 You are currently browsing the archives for the Windows Server category.